In our last post, we learned about one of the first steam engines, the Hero engine. As ingenious as it was, it was not developed for any practical use. In fact, it was not until nearly 1700 years later that steam engines began to be used productively on a widespread scale. Over the centuries, a few steam powered devices were developed, including a musical organ, steam-powered fountains, and water pumps. But none of these inventions were engines – in other words, a device that converts energy into motion. The first steam-powered engine that actually did something besides just turning around was the Newcomen engine, or atmospheric engine. 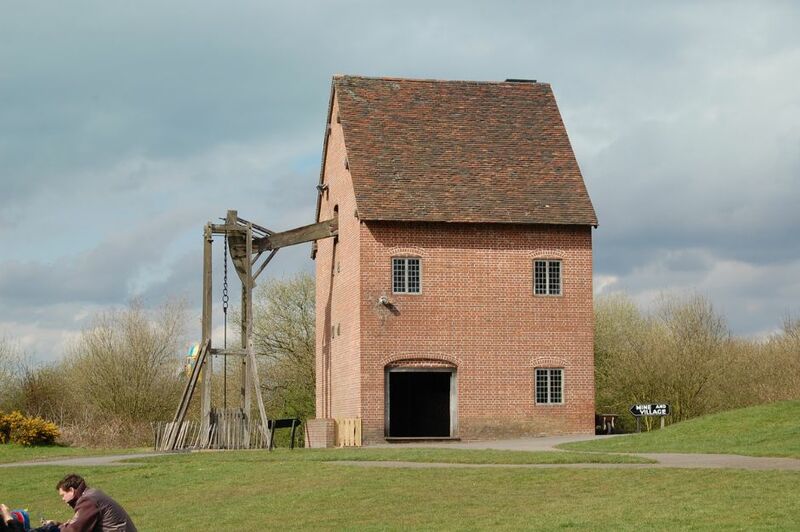 Thomas Newcomen developed his engine in 1712 for the purpose of providing power to water pumps lifting water out of mines in England. Newcomen’s engine was also called the atmospheric engine because of how it was powered. While Hero’s engine was powered by the force of steam pushing outward, Newcomen’s engine worked with vacuum (empty space) power, or, as it was called then, the atmospheric principle, which worked by pulling with the power of a vacuum. 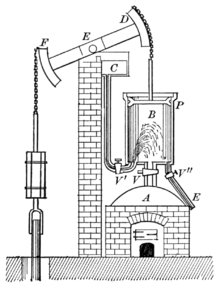 The basic parts of the engine were the boiler (A in the diagram), where water was heated to produce steam, the piston and cylinder(P and B), where the actual engine work was done, the see-saw-like beam (E) that swung up and down, and the chain which was attached to the pump (F). In its entirety, the engine was very large and a special building was constructed to house it in. To start the engine, water in the boiler was heated, producing steam. The steam was released into the cylinder, which sealed with a valve (V). Then, a small amount of cold water was sprayed into the cylinder. This was the key part of the operation. When the cold spray of water entered the cylinder, the steam condensed, or turned back into water. Since the cylinder was sealed, this created a vacuum, or empty space with less air than the area outside. The cylinder then acted as a suction, and pulled the piston, the metal disc that moved inside the cylinder, down. The piston in turn pulled the chain that was connected to the beam, which in turn pulled the pump up. The cylinder valve was then opened, which released the piston and a weight at the F side of the beam pulled the beam in the other direction. This operation was repeated about 12 times per minute. 120 gallons of water per minute were able to be pumped out of the deep mines, just by the power of a vacuum! The atmospheric engine went into use in mines throughout England, with over 100 installed in Newcomen’s lifetime. Although it was popular, it required a lot of fuel to operate. So, in 1769 James Watt came up with an improved version. But that will have to wait for the next chapter!